You don't bridge subwoofers, you bridge amplifier channels. I also would like to know he best way to wire them up. Im doing this because im reading it is harder to wires and supply a odd number of 12's on one amp. I want something sub+amp that will give me a loud hitting system. On an unrelated note, my old box was way too small and the port wasn't sized right, to get more space in the box, I flipped the sub upside down so there was no sub displacement, is that okay or does it affect performance? The book says it is 1700 rms 4ohm x 1, max 3500rms 2ohm, max 5000rms at 1ohm. Sounds great now is this sounding feasible or a fire waiting to happen? Cuz I know my amp doesn't support 1 ohm and at 4 ohm they're really underpowered. You should be aware that this large a system in any vehicle will be a challenge to power. I have a ford ranger so it limits the size of my sub choices any recommendations would be a plus on subwoofers in your opinion. And what's the point of wiring the factory speaker wires into the wiring harness for the head unit? I know they can be wired at a 0. Would i need a y channel amp if thats even a thing? Assuming your amplifier is not stable for a one-ohm load, you'd have to connect it all up , at 4-ohms, resulting in half the power directed through twice the number of subs. I will also be purchasing a 4 channel amp to power them. It seems pretty difficult to get the new wiring through the doors cleanly. Which would mean 4 sets of rca's. Series wiring and parallel wiring These terms refer to two ways of routing the speaker wires to your subs to properly manage the overall impedance load. Just received them today and I actually received 2 single 4 ohm, and 1 Dual 2 ohm. I was looking into your Rockford Fosgate R2D2-10 or R2D4-10. I had them wired down to 1ohm with parallel wiring and when they went all wack i wasnt bumping much harder then my old 400 watt rms system i thought. If you want to learn more about amplifier systems, check out our. Currently I have the subs wired to just one of the two terminal cups on the box and I was wondering if there is any reason that I should wire each sub to its own terminal cup. The only way to know for sure is to install your sub and amp and see if your headlights dim when the bass hits hard. Do you have any recommendations on amps? I am running them at 4 ohms do you know how many watts I would be getting to my speakers. The second is more specific. If that isn't enough loud bass for you, you can always step up to a higher-powered amplifier, say a 400- or 500-watt model. The system depicted includes new speakers, an aftermarket , a for the front and rear pairs of full-range , and a for a. Can you recommend other subs that would pair well with my Kicker Amp? This is a passive system. I read in the stereo manual and says that if you can connect, the only thing you can not connect in bridge mode is a forward channel with a back channel. If the signal used lacks bass, there won't be any for the sub either. On the other hand, maybe you just need a , in order to make the bass in your car sound its best. But regardless I need to know whats the best way to hook them up to get a safe stable workload of the loudest hardest hitting bass these can produce. I figured if it sounded like crap I could unport it. For immediate help, you can contact them via phone or chat - just click on the phone icon at the very top of this page. If they are, you can treat each set like a single 4-ohm speaker. Any idea what's going on here? I am using a 4 channel amplifier for these, but I would like to add another amplifier and a subwoofer, too. Not knowing exactly what amplifier or subwoofers you're referring to make it impossible to give advice on how to wire them together or even know if they'd work together at all. Both of these amps equal 100amp, so i have a 100amp breaker at the battery. There are many different amplifiers that can handle those subwoofers. However, you should know that a subwoofer driven by a high-passed amplifier channel will not play bass, but only the notes above the high-pass filter's setting. And yes, you can run separate speaker wires for your two subs to the amp's speaker output terminals. It requires 4-gauge power and ground wires, so you could start there. Infinity doesn't publish what crossover points their drivers work with. But, a better plan of action would be for you to take your gear to a car audio installer and see if they'll test it or install it for you. I don't know if I should get a two channel amp and power each sub individually or what. And everything was purchased from Crutchfield wouldn't think of buying anywhere else. My budget allows me to get a amp that puts out exactly 600w rms but I could get one that puts out 800w rms for not much difference in price. Currently got a new project going on with my 4x4. First question, is this set up a decent combination or should I search for a different amplifier? If i follow the diagram or if i leave my setup intact, its not essentially incorrect, right? 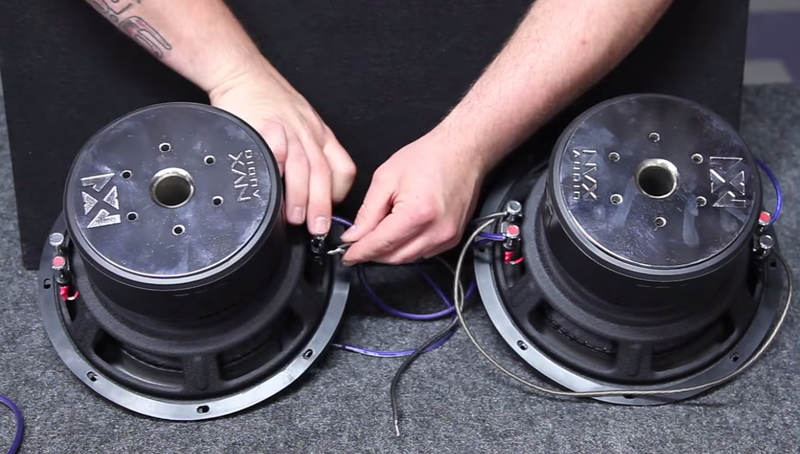 In any case, for subwoofers, you should use 12- to 16-gauge speaker wire. That amplifier isn't stable for a 1-ohm load, so that's probably what you're hearing: the amp freaking out. You'd connect the factory radio's speaker output wires to the amp's inputs via a harness or adapter. Just don't expect much bass from this system.